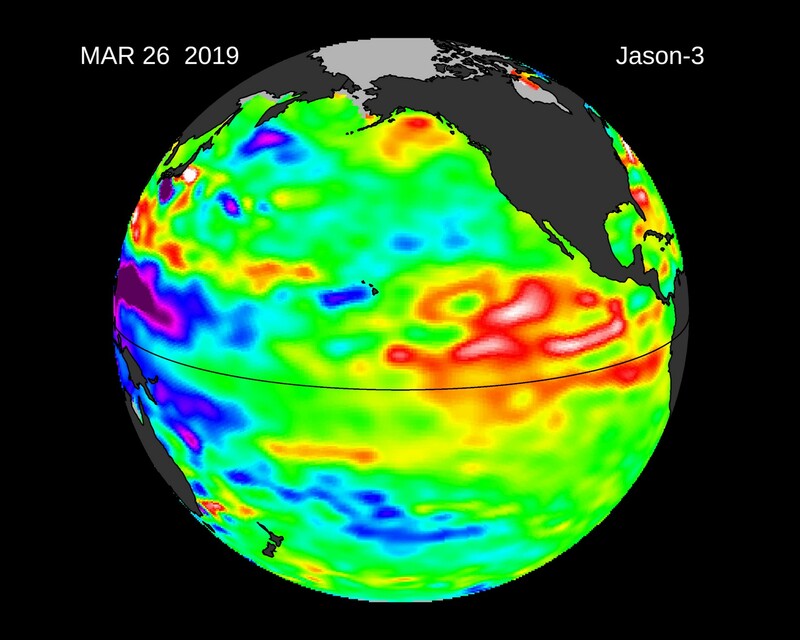 These are the latest images from the OSTM/Jason-2 satellite. Jason-2 continues providing the uninterrupted time-series that originated with TOPEX/Poseidon. 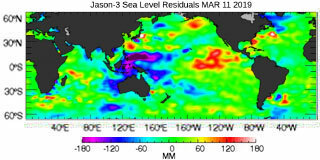 Jason is using radar altimetry to collect sea surface height data of all the world's oceans. 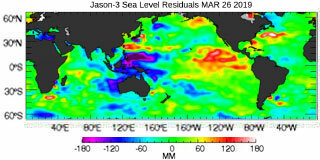 These images are processed to highlight the interannual signal of sea surface height. The mean signal, seasonal signal, and the trend have been removed. 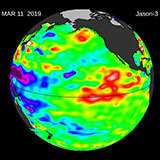 The height (or "relief") of the sea surface is caused by both gravity (which doesn't change much over 100's of years), and the active (always changing) ocean circulation. 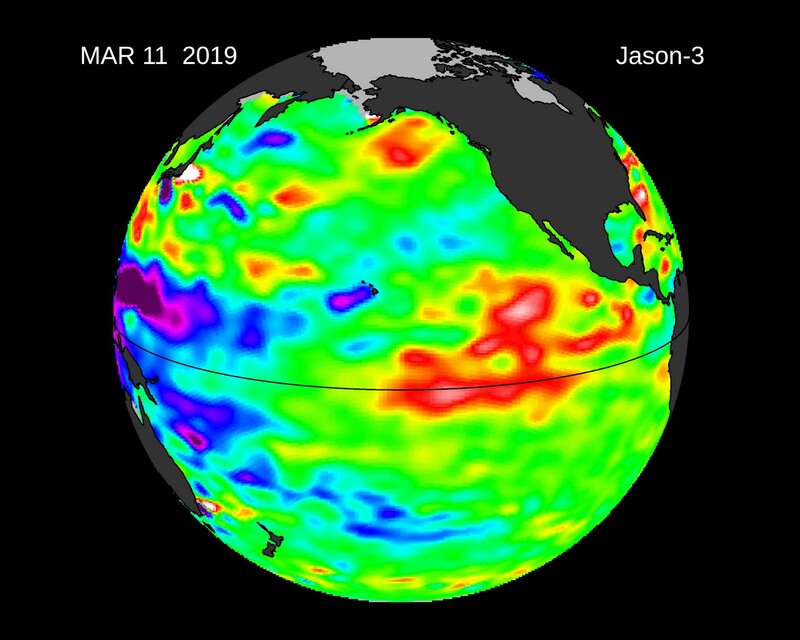 The normal slow, regular circulation (ocean current) patterns of sea-surface height move up and down (warming and cooling and wind forcing) with the normal progression of the seasons ... winter to spring to summer to fall. 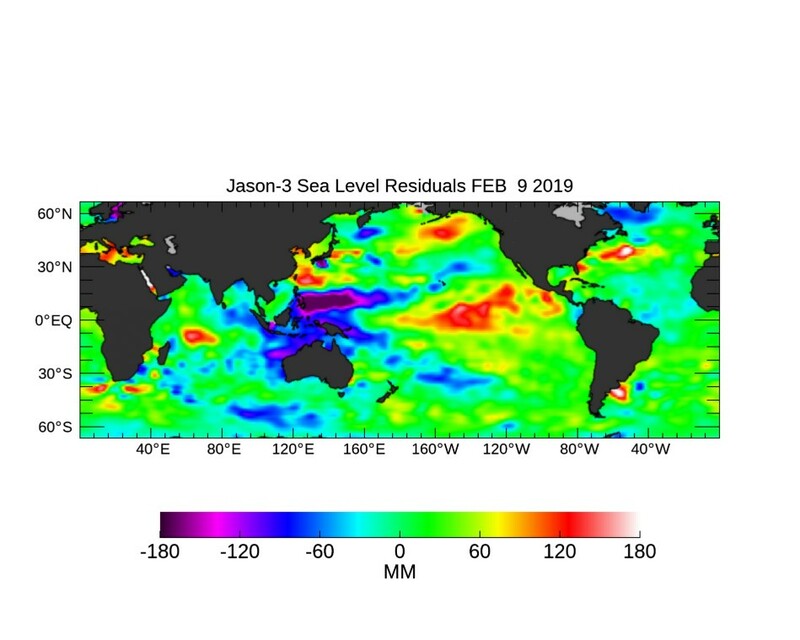 Using theory of ocean dynamics, TOPEX/Poseidon and Jason sea-surface heights can be used to calculate how much heat is stored in the ocean below. 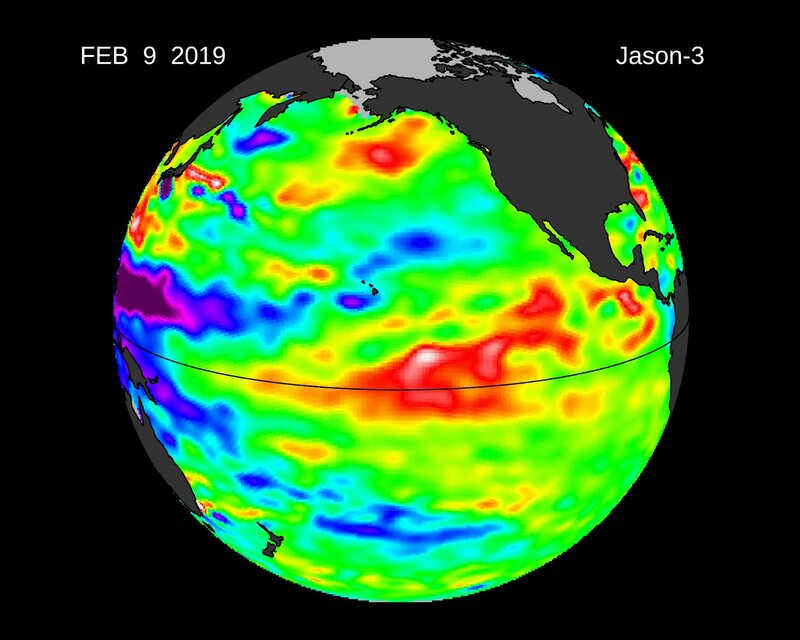 The year-to-year and, even, decade-to-decade changes in the ocean that indicate climate events such as the El Niño, La Niña and Pacific Decadal Oscillation are dramatically visualized by these data. 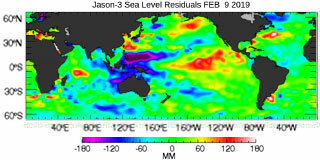 Sea-surface height is the most modern and powerful tool for taking the "pulse" of the global oceans. These images show sea surface height anomalies with the seasonal cycle (the effects of summer, fall, winter, and spring) removed. The differences between what we see and what is normal for different times and regions are called anomalies, or residuals. When oceanographers and climatologists view these "anomalies" they can identify unusual patterns and can tell us how heat is being stored in the ocean to influence future planetary climate events. 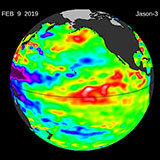 Each image is a 10-day average of data, centered on the date indicated.